This blog article was originally written by Christine C. Reed for her blog BlissChick on May 13, 2009. In the midst of someone's dying, it can be difficult to see anything but your own sadness over losing them. Your own grief that they will be gone -- or at least their gross self will be gone. Their subtle self is never gone. A few years ago, though, I did not know that. Even after being given the gift of a near death experience, I still doubted, and I got to the point of utter denial. I got to that very soul deadening place of over-intellectualizing everything, and in thinking I was so smart, I was living pretty dumb. Then two big deaths came and cracked open my hardened heart. Thank God! At the time, it felt like the crack might just do me in, but of course, it is that cracking open that allows the light to enter, allows the real life to begin. With my newly opened heart, I decided to stop listening so much to my closed mind, and I headed, for the first time in my life, to a place near hear called Lily Dale to meet with a medium. What?! My smarty brain self was saying. What the hell are you doing? Are you becoming some sort of freaking freak? I told my brain, via my heart, that I would rather be a freaking freak with people who remain open to all possibility than to be closed off and cynical with the people who think they are so smart. And that was that. I still fight that urge, sometimes, to question, to scoff, but mostly, deaths that felt so awful ended a part of me that needed to die. People like Kathy Crabbe are here to help us with our hearts. An artist and soul reader, Kathy Crabbe shows you where the cracks are and helps us to let the light in. You can find her art here and you can even get a virtual reading through here. 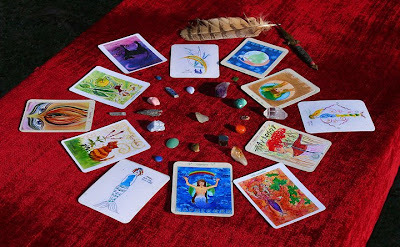 Cards that Kathy designed and uses in her readings. Describe the PrimaryBliss of your life. How did you come to know that this was your PrimaryBliss? Currently, my primary bliss is working as a soul reader, psychic-medium, and spiritual healer in a one-on-one relationship with clients who are seeking transformation and inner knowing so that they can live the life of their dreams. Previously, I had been a full time artist, but when I started getting closer to age forty I started yearning for an even deeper connection with my clients. I wanted to communicate with them, not just on a visual level, but through words as well. What types of choices and sacrifices did you make to be able to craft this bliss-filled life? I don’t feel as though sacrifice is a word that applies to my life. I prefer to work with the word ‘choice.’ I have chosen a life that allows me plenty of free time, solitude, peace, and quiet so that I can progress in a way that benefits my work and my clients. How does your PrimaryBliss radiate out into the rest of your life? My belief is that one should “walk their talk” so my hope is that by living my own life in a positive, caring, and soul centered way, it will inspire others to do the same for themselves. What are some other activities that also give you this sense of bliss? Things that make you lose track of time? Dancing, music, walking, swimming, being in nature, meditation, reading, laughing with friends, painting, sketching in nature, traveling with my husband, and playing with my dog. What is your daily or weekly spiritual practice? I work on soul readings 5 days a week. In preparation for a reading, I work to center myself in the present through 15 minutes of yoga, followed by playing my Native American flute, meditation, and prayer. I end my readings with prayers and healing blessings. I also get out in nature and walk my dog every day, which to me is a spiritual practice! What music is your bliss? I really enjoy Celtic music and electronic trance/dance music. Name books or authors/poets or people who are your bliss, who influenced your bliss. My favorite author is Margaret Atwood, for her brilliance and biting humor, plus she connects me with my Canadian roots, as does the poetry of Al Purdy, another blunt, humorous and brilliant thinker, who also happens to write poetry about beer. I love reading the Seth books in bits and pieces along with the astrological and channeled books of Barbara Hand Clow. What advice would you give to someone who feels they have not yet discovered their PrimaryBliss? Sometimes patience is all that’s required. It takes time to really understand what’s important. I never did find the perfect guide or mentor; I learned in bits and pieces from everyone and everything, taking and leaving what worked and what didn’t work – it’s all a patchwork quilt, every life is unique, so don’t expect any one person to have all the answers – that’s advice that pertains to me, but again, it may not pertain to you! Do you have a favorite quote you would like to share? I think that may be one of my favorite quotes to show up in one of these interviews. I thought, yep, that would totally work -- just twirl. I also love that Kathy points out something that is so obvious but that I think we forget in this perfectionist, Puritan-leaning culture: to do what comes naturally, to work with your strengths, rather than focusing on your weaknesses and trying, trying, trying to "improve" them. Who said it was supposed to be that hard!? We are sent here with natural gifts, and those gifts will lead us to our Great Work if we allow them to. What would happen to your life if you simply focused on your strengths day to day, hour to hour?